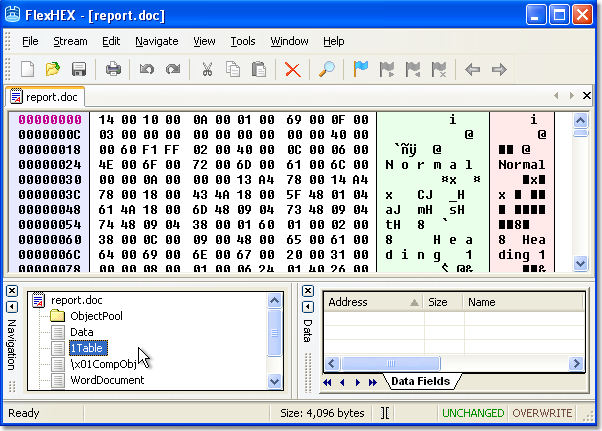 FlexHEX is the only hex editor that recognizes and edits OLE compound files. A compound file is a file system in the file or, if you prefer a more exact wording, a file-based implementation of OLE Structured Storage. Like a file system, a compound file contains some kind of directories and files, which are called storages and streams. It is easy to see that the file contains a number of separate streams for storing the document data, its formatting information, summary and so on. Needless to say, an attempt to edit such a file in a hex editor as a raw binary file will corrupt the structure and render the file invalid. FlexHEX, however, is up to the task!